This trailer makes me wish it's August already! If you don't know what it is, it's the prequel to Planet of the Apes. The movie adaptation was first made in 1968 with a remake in 2001. I expect to not see mistakes that were made in previous Planet of the Apes movies, among some of them, non-human apes were portrayed walking upright with a human gait. All the non-human apes in this movie will be CGI so I expect the designers to have done their homework. Though one seem to wonder, did these non-human apes (from the movie) evolved a bipedal gait just like those of human? What do you think? Are you as excited as I am about this movie? I am interested to see how this movie portray the ethnics and "consequences" of primate testing in labs. I think I might Netflix the previous movies before I watch this one in August. EDIT: IN CASE THE DATE OF THIS POST IS NOT ABUNDANTLY CLEAR, THIS IS AN APRIL FOOL'S POST. 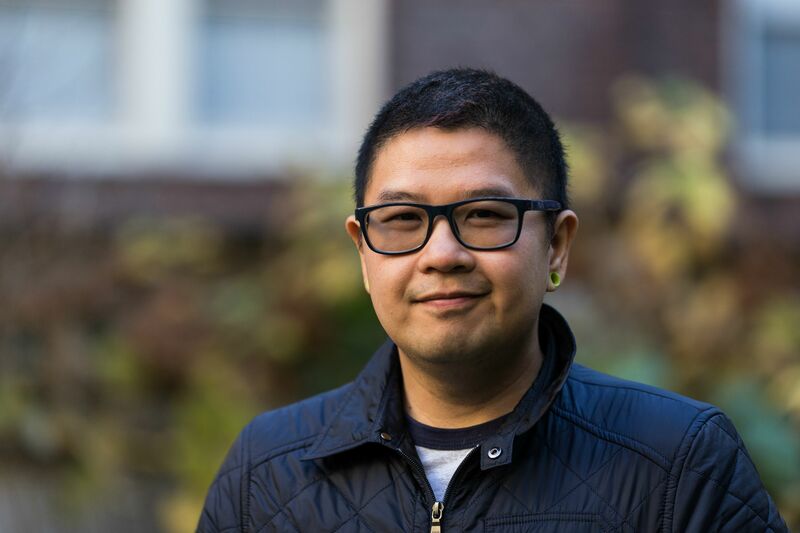 A recent study shows that homosexual behaviors in orangutans occur more frequent and could possibly mean that there are more homosexual orangutan that we previously thought. The study by Smith et al. (2011) found that, statistically, 1 out of 10 orangutan is actually gay. One of the example from the study described two male Sumatran orangutans (Pongo abelii) whom the authors believe are "totally gay". Two male Sumatran orangutans were first observed making a nest together for the night. Orangutans make makeshift nests to sleep at night which they abandon during the day. 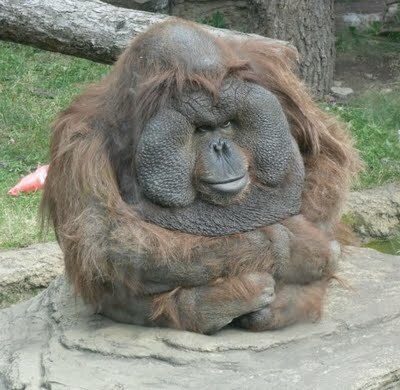 Every night, orangutans make a new nest. Not only was it peculiar that two male orangutans would sleep together in the same nest, they seem to have taken a liking to their nesting site as well. The duo returned to their nest every night to sleep and would leave together during the day to forage for food, swinging side by side. An example of orangutan nest. Siegfried and Roy's nest are much bigger, elaborate and fabulous. The researchers nicknamed the two males "Siegfried" and "Roy" and posit that Siegfried and Roy were most probably attracted to each other's large cheek pads. Telling Siegfried and Roy together is not hard. Roy has a scar on his face, a reminder of his escape from the jaw of a Sumatran tiger. 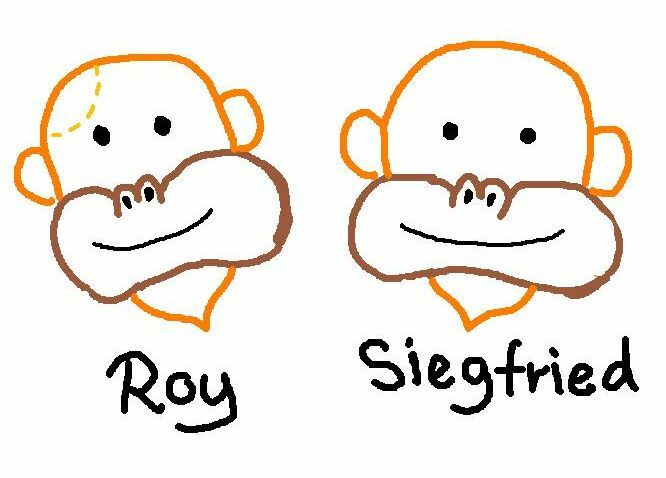 Not wanting to release the identity of "Siegfried" and "Roy" for fear of homophobic retaliations from other orangutans, the authors released a sketch (below) that was included in their paper. This is what Siegfried and Roy supposed to look like. Smith et al. (2011). Researchers were puzzled at first as to why these two males would bring objects back to their nest. Periodically, these two orangutans would bring back flowers and "kitschy" forest objects like dried twisted twigs or moss balls. Immediately after bring these objects back to the nest, they would then meticulously decorate their nest with them. "The objects that they bring back to the nest, it's like straight out of a Crate and Barrel store", Smith jokes. Remarkably, one of Smith's field assistant, Dorothy, fell in love with the orangutan couple and had decided to continue the study for her PhD dissertation. Friends of Dorothy were not shocked. "Dorothy simply adore those flaming apes", said one of them. Siegfried and Roy would bring moss balls like these (pictured above) back to their nest. Photo from Crate and Barrel. 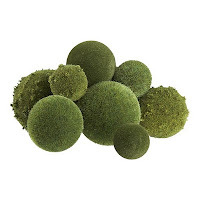 Real moss balls sold by Crate and Barrel, $12.95 for all 9, excluding tax. Smith et al. (2011) reached out to Kanzi, a bonobo that uses lexigrams to communicate with human primates, for comments about their findings. Despite multiple attempts to ask Kanzi questions, he seemed to be fixated to only two lexigram combination. "We asked Kanzi questions like 'What do you think of these gay orangutans?'" said Smith and all Kanzi said was "Bi-Winning". "Maybe Kanzi was trying to tell us that bonobos are mostly bisexual but we're not sure why Kanzi kept giggling and saying 'Bi-Winning'", Smith added. Results of this study will be presented at a primatology convention this year. However, the authors are hesitant to present their findings anywhere near the Bible belt due to homophobic protests. The homophobic Rat Pobertson (above), planned to protest the authors' findings. Pobertson claims that gay orangutans should be send to palm oil plantations as slaves. Smith, JO. Fuqua, K. Gilman, I. Vagell, N.Dorothy, G. 2011. Flaming Apes: An Observation of Gay Sumatran Orangutans. Der Primaten 41(2011): 20-25.